Hi girls! Welcome to day one of the Bridal Collection, a collection of designs I’ve made for summer weddings. The flowers in the entire collection (shown above) were designed using Dahlia Nestibilties. JustRite Romantic Sentiments and Loving Thoughts sets were perfect for the theme and used throughout the designs as well. A Bridal Collection Product Page has been added on a tab at the top of my blog banner with links to all the products used in the designs and sold at A Touch of Grace – Paper Boutique. In an earlier post, I mentioned that my 27th wedding anniversary is coming up in June. My anniversary is what gave me the inspiration to design a vintage bridal collection for summer weddings. As you can see from the picture above, there are many designs. I’ll be back each day with a design and a lot of pictures. I haven’t had time to work on tutorials, I’m thinking of u-tube videos, but will have to play with that idea. I believe I only get 10 minutes per video and will have to figure out a way to get it all done within that time frame. I’m starting with the bride’s card first, it’s quite large, the design is 6″ x 8 1/2.” The base of the card is Very Vanilla card stock. 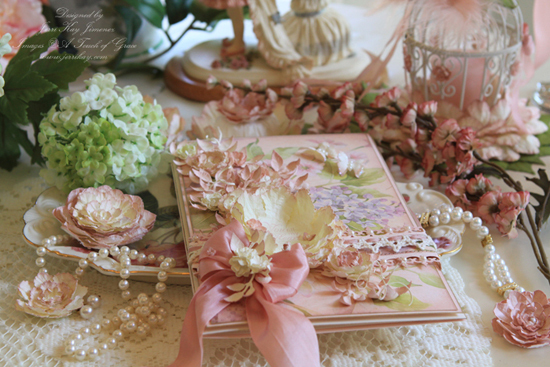 Brenda Walton DP was adhered to Blush Blossom card stock for the next layer (placed on Joy! Craft Foam dimensionals). All three layers were edged with an 18 Kt. Gold Krylon pen. A Martha Stewart edge punch was used on both sides of the band. I wove 1/4″ silk ribbon through an old piece of crocheted lace I found in my stash. Kaisercraft pearls were placed on the band. Using the #4 die from the Dahlia Nestibilities, I cut three flowers from Very Vanilla card stock. Using small scalloped edge scissors, I cut in about 1/2″ on each petal and around the edges of the petals as well. Using a small sponge dauber, Soft Rose ink was sponged around the edges of the petals. Using a wash of light green water, I painted the flowers. The green water wash was made by mixing 3-to-4 drops of Tinta Leaf Green ink into a small bowl of water. Once the wash was dry, it gave the flowers a very natural, slightly green cast. 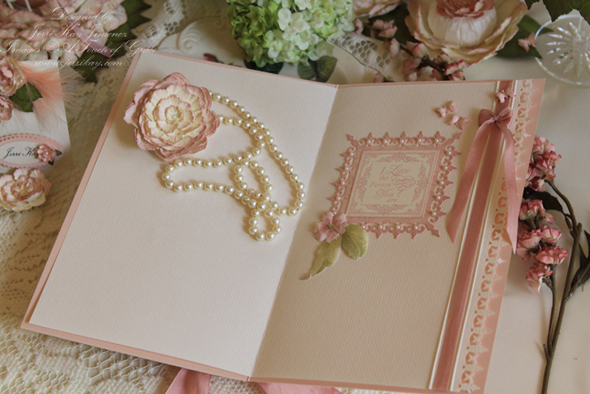 A sentiment from the JustRite Loving Sentiments set was stamped in one of the flowers using the Soft Rose ink. 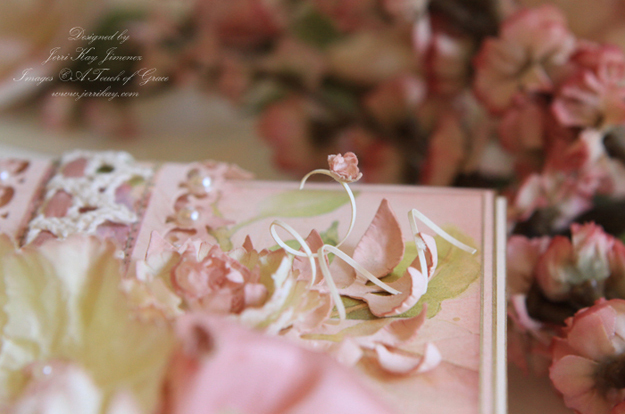 The flowers were then embossed and layered with the sentiment stamped flower being placed on the top. 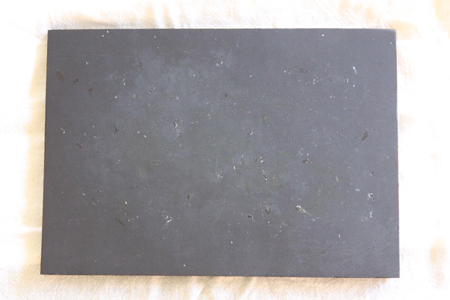 Perga Glue was used throughout the entire collection for a quick drying, strong bond. Using the smallest Dahlia flower (#1), I cut two flowers from Blush Blossom card stock. Soft Rose ink was sponged on the edges, the flowers were embossed and adhered together (all sponging on the flowers and leaves in the collection was done with small and large daubers). Kaisercraft pearls were placed inside the small flowers. Two small butterflies were adhered inside the flower. Using the Dahlia dies, I made several flowers in different sizes. 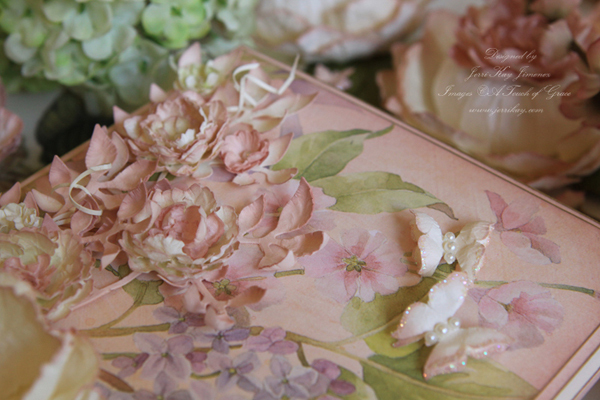 Very Vanilla and Blush Blossom card stock was used for the flowers and leaves on the card. 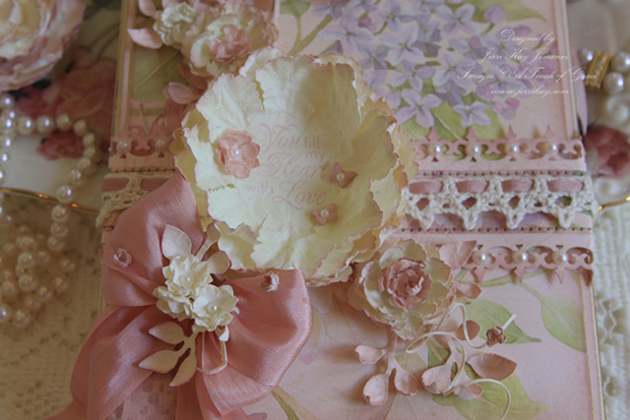 I varied the flowers by using the scalloped scissors on some of the flower petals. The light green wash was painted on all flowers that were made with Very Vanilla card stock. This picture shows the dimension of the flowers and butterflies. I made up extra flowers to be used on designs at a later date. They are so pretty laying on the table with the pearls. 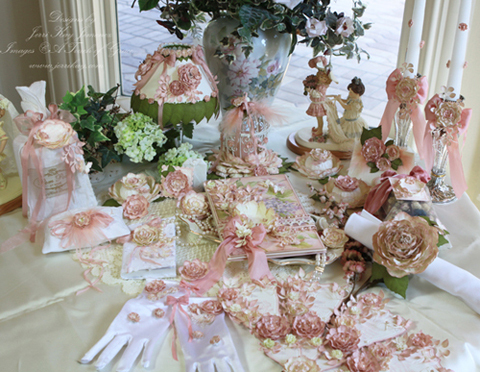 What a great way to dress up the bridal table! I love the idea of using 30″ strands of costume jewelry pearl necklaces on the table with the roses arranged over and around them. If you have family or friends with weddings coming up, please feel free to have them visit my blog for ideas and inspiration. The leaves were made with a Sizzix leaf branch die (see Bridal Collection Product Page for links to all product highlighted in pink throughout this collection), all edges were sponged with Soft Rose ink. The butterflies were punched with a Martha Stewart butterfly punch, sponged, embossed and glitter was applied with a Quickie Glue pen. Kaisercraft pearls were adhered to the abdomens. A guillotine paper cutter was used to cut the tendrils, they were then dampened and wrapped around a pencil until dry. Once removed from the pencil, I stretched them out slightly to avoid a coiled look. I used 1.5″ silk ribbon for the bow, making double loops. Three white flowers (tinted with green water wash) were adhered to the center of the bow, as well as leaf branches. Tiny flower buds were adhered on the silk bow. I made those with the Fancy Crafts Twin Punch (the butterfly). When embossed with pressure, the butterfly curls in looking like a small bud. The firmness of the embossing pad I use gives me the support I need for the pressure used to curl the butterfly without the embossing tool perforating the paper. See the flower to the lower right of the large flower, I used a Martha Stewart butterfly punch and a Fiskars butterfly punch to form the inner petals in darker pink. They were adhered inside the Dahlia petals with Perga Glue. I used these punches for a few of the mid-size flowers, I wanted to give the flowers a natural look by varying the petals so they wouldn’t all look alike. Embossing side of Embossing mat. Perforating side of Embossing mat. All embossing throughout the bridal collection was done on the Pergamano embossing pad shown above. I recommend the pad for embossing on parchment paper as well as card stock. 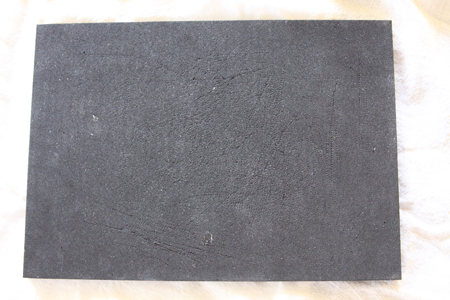 It has two surfaces: one side is made for embossing and the other side is made for perforating. 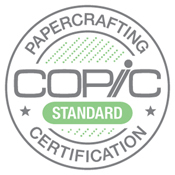 The side for embossing has a smooth rubbery mat that was designed specifically for embossing on parchment. The firmness is wonderful! It gives just the right support so that embossing can be done without the embossing tool perforating the card stock. For parchment craft I recommend this pad for embossing, but recommend a perforating pad for perforating. Why a different pad since this pad has a perforating side? Because I get so focused on the design, I forget to turn the pad over and accidentally perforate on the embossing side, which is not good for the embossing mat. I love playing with the little flower buds and have sprinkled them throughout the designs. You can see the gold edging in this photo, I love the Krylon pen for adding a touch of gilded elegance to a design! I used Carnation White stationary paper for the inside of the card. It’s approximately one-half the weight of the Carnation White embossing paper, about the same weight of stationary paper. The Martha Stewart edge punch was used on the right side of the paper and on the layer below the sentiment. Silk ribbon was placed inside the two embossed (a Scor it embosser was used to emboss the double lines) lines, together with a bow and a few butterflies. The rose and leaves were cut with a craft knife from the Brenda Walton DP. 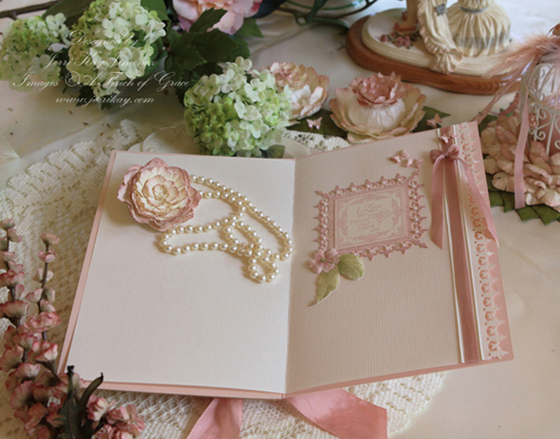 I used the JustRite Romantic Sentiments set and the 2″ Decorative Frames and Borders set for the inside of the card. 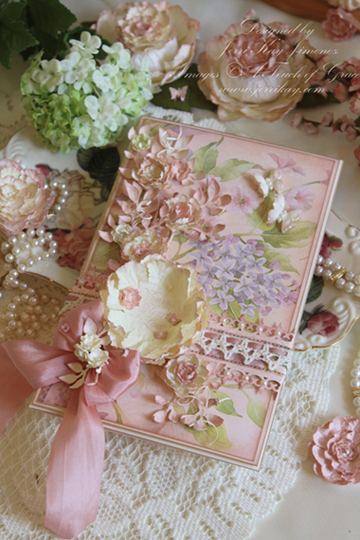 The sentiment was stamped on Very Vanilla and layered on Blush Blossom card stock. For your shopping convenience, refer to the Bridal Collection Product Page at the top of my blog banner for links to products used in the designs. Martha Stewart punches can be purchased at Joan’s Gardens. Silk Ribbon was purchased at the Stamp Simply Ribbon Store. Thank you so much for stopping by, I’ll be back soon with the next design. WOWEEE! Jerri, this set is simply stunning! Any bride would be thrilled to receive a card from this collection. Well done, Jerri! WOW! I am speechless. Just perfect and beautiful! This is exquisite. You certainly know how to turn a plain piece of paper into a thing of extreme beauty. Love all your work and detail in this presentation. Thank you so much for sharing it was a joy to sit and look and read. Oh my, Jeri! Tears come to my eyes with how beautiful this is! Oh my! This is stunning. Can’t wait for the tutorials! Any bride would love all this…great creativities. Your designs are always soooo beautiful. Thanks for sharing. Oh My Jerri!! I’m always in awe of your work, but this time you’ve gone even more above and beyond!! Your flowers are stunning!! And I love the texture of your petals!! And of course, there are all the little added details that make your projects so charming!! Fabulous work!! Jerri, you just keep topping yourself with all these wonderful projects. What a stunning collection. My jaw is still on the floor! I’m always in AWE of your work but this is unbelievably awesome. I’ve never seen anything like this and it’s just over the top gorgeous. Absolutely beautiful! I can hardly wait to see what’s ahead. Oh my goodness Jerri, this is so awesome. It is drop dead gorgeous and I know you had lots of fun designing it. There aren’t enough adjectives to even describe its beauty! I can’t wait to see the rest of your creation. Wow Jerri, this is breathtaking. I agree with Joan, there just aren’t enough adjectives to describe how beautiful your work is. This is the type of vintage I absolutely love. What talent you have. Looking forward to the rest of the items in this gorgeous collection. Wow!!! What beautiful work!!! Thanks for sharing! Oh Jerri ~ You are right…I DO LOVE this flawless artwork!!! I cannot put into words how you have surpassed every little detail here. 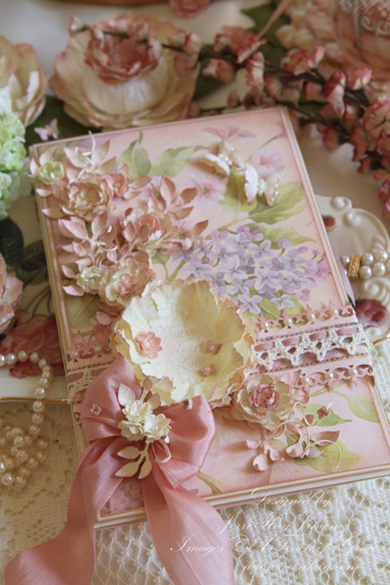 You have such a highly refined taste in every dainty detail of this card! 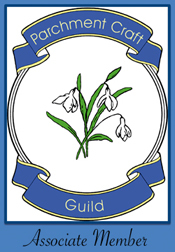 Card? More like a very pricey vintage treasure that anyone would drool over…as I am now! Thank you for sharing all of the details on this. Oh what I would give to just make one flower as beautiful as the ones you have here! Your work is always so elegant and breathtaking. I read in your email that you would like to do videos – maybe YouTube. I wanted to suggest UStream. I have been following another person, Laura Denison, of Following the Paper Trail who is doing instructional videos on UStream because you can go much longer. Some of her’s are over two hours. She records them as she does them so you can go back and watch over and over. Thanks for all of your beautiful inspiration. These are just beautiful!!! Everytime I check your post I am always amazed. Thanks so much for sharing. Oh my gosh! Simply stunning! A true keepsake in every sense of the word. Thank you so much for sharing your marvelous talent with the world! Beautiful and Stunning what else can I say. This collection is a master piece. Every time I see something you have made I think how can she top this, but you do. I am so happy that you share with us because we would miss a world of beauty if you didn’t. Jeri, this is totally awesome and I would love to have a room to have this on display for me to look at everyday, what’s not to love about this!!! You have put so much love and labor into this………………how can you give it away? Jerri, your talent absolutely stuns and amazes me!!!!!!!!!! This is so beautiful!!!!! 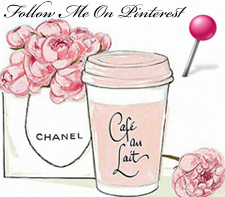 Checking out your blog is like eating a scrumptious desert!!! 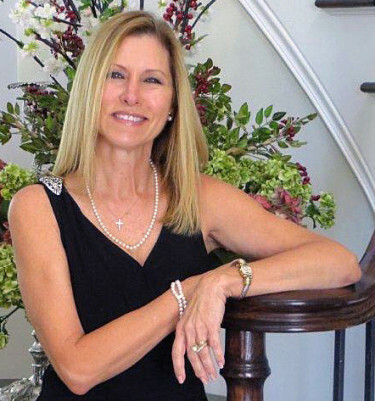 Jerri, another truly amazing project…they just keep more and more gorgeous! WOW, STUNNING!! I thought your work before was awesome, this is just as beautiful. Your hard work and love of the craft really shows. I love it all! Oh so beautiful!!!! You do such great work, you are always such an inspiration for me. Sigh, absolutely breath-taking! Thank you for sharing…now to go back and study the how to of it all! Your work is sooo beautiful! I just have to keep looking at it to admire all the details you have added to everything. as in the words of usher – O M G!!!!!!!!!!!!!!!!!!!!! Your talent floors me every time, you truly are an artist. Jerri, this entire collection is over-the-top GORGEOUS! The flowers you have made are THE most beautiful I have ever seen — I can’t imagine seeing these items IRL and being able to touch them — JUST BEAUTIFUL! What a treasure!! 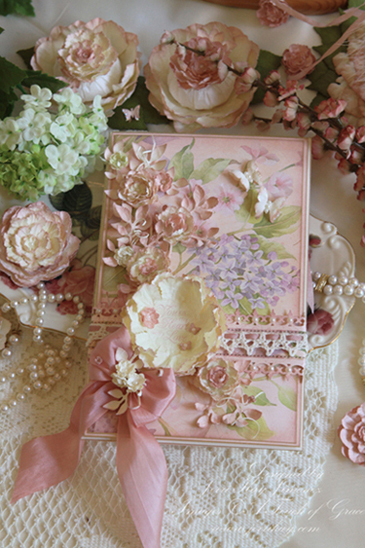 That bride’s card would be a keepsake forever for any bride. It’s a breath-taking work of art. Oh my word…this is over the top, Jerri!!!! Every little detail is pure perfection!!!! 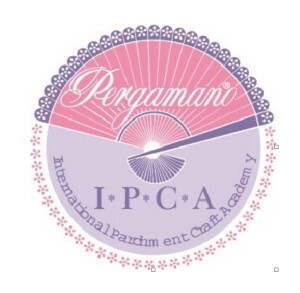 I love the beautiful colors and elegant designs…..you do the most FABULOUS work!!!! I am speechless , I just don’t know for the life of me how can a little gal think of all these gorgeous ideas that you have in your sweet head!!! Then put them alll together like it is nothing at all to do….. Jerri, you are one in a million! So perfect and they look good enough to eat. WOWZER!!!!!!!!! Is my feelings and I am so blest to be able to at least look at your fabulous handi work!!! You are the top of my list of blogs and I hurry in to my computer room just to see what you have for us today. Words cannot express what we see when we look at your wonderful handiwork!!!! We love you Jerri and thank you for all the beauty you spread all over the world. God Bless you and your family.